Disaster Recovery should be more than protecting data. We’re raising awareness of Disaster Recovery and pet protection in the workplace. At virtualDCS we love our pets just as much as you do. One of our company values is that we strive to make virtualDCS an awesome place to work, where we can bring external our hobbies and interests into the office with us. Not only do we have a pool table and a games console, but we also occasionally have a host of friendly four-legged visitors. In case you didn’t know already, virtualDCS has a quarterly theme that we integrate throughout the office and on social media. When it came to deciding this quarter’s theme, the animal lovers amongst us wanted to bring our faithful pets into the workplace! 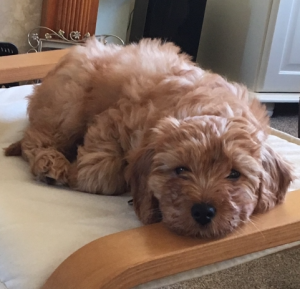 Each day, more animals are being welcomed into the office and with studies proving that office animals reduce stress, who wouldn’t want their pet with them at work? This made us wonder, is it plausible to bring animals into work? Can a business ensure their safety? How do pets and Disaster Recovery plans combine? 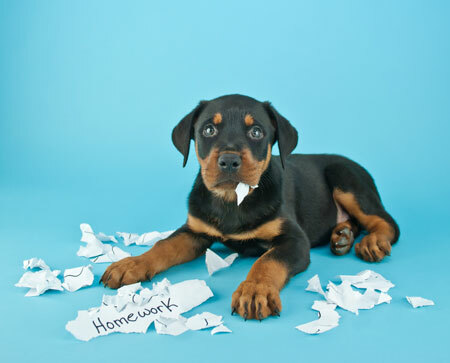 Our chosen focus made us wonder how many businesses include animals in their office Disaster Recovery plans. In the event of a disaster hitting the office, staff safety and data protection are the first thoughts, but how do office animals fit in now they are on the rise? After all, we have a duty to protect our pets from both physical and psychological harm. This is when we decided that office animals also need to be included in an organisation’s Recovery plan and that DR is about much more than protecting data. So, while we’re actively promoting our Veeam Cloud Connect solutions this quarter, we thought we’d also do some good and raise awareness around pet safety in the office. After all, they should go hand in hand and even if we could help just one animal, we’ll have made an impact. Join the fun, raise awareness and win great prizes. To take part in the fun and help spread awareness, simply head over to our Twitter page where you’ll be able to see office updates around our animal assistants and the mischief they’re causing. We’ve also got some great games that you can take part in. 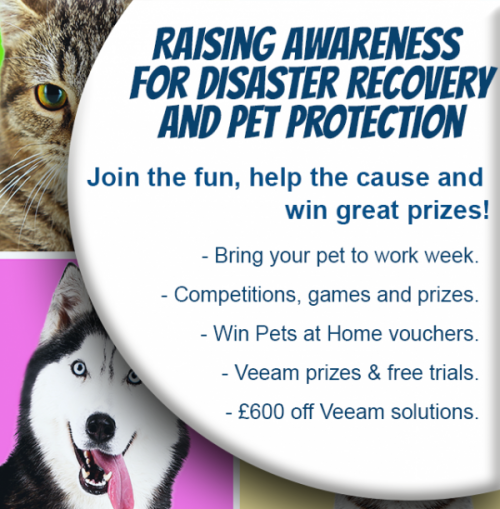 By showing your support sending us a tweet, not only could you make a difference in the life of an animal, you can also win a range of great prizes, including Pets at Home vouchers and Veeam goodies! From caption competitions to the cutest pet awards, we’ve got something for everyone to enjoy. What are you waiting for? Get involved, today. As a thank you for helping to spread the word, we’ve partnered with Veeam to offer free 30 day trials and up to £600 off Veeam Cloud Connect solutions. Working together we can help create a Disaster Recovery solution, controlled from one central console. Protecting your data offsite, you’re in complete control of all your on-site and off-site backups, giving you the power to invoke your Disaster Recovery strategy if any Gremlins should pop up. There are three competitions throughout the event and no cash alternative available. The winner of each competition will be contacted via Twitter and if the winner doesn’t respond within 5 working days a new winner will be drawn. Entries must be received before the dates listed above for UK residents only. Competitions 1 and 2 exclude virtualDCS employees and close relatives. The prize will only be shipped to a UK address. Unlimited entries allowed are allowed (with the exception of competition 3) but all steps must be completed to enter. By entering the competition you are bound by the terms and conditions and the winner agrees to let virtualDCS use their image and information for future marketing purposes. All images from entries will also be retained for future promotions. virtualDCS has the right to cancel, amend or withdraw the promotion at any time.